About us - What is Iron Horse Park? The miniature trains, track and landscape at Iron Horse Park represent the Canadian Pacific Railway (CPR) from the prairies to the coast. 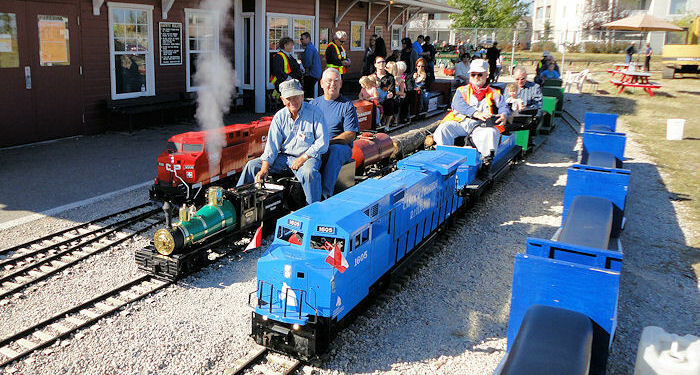 Take the 1.6km interpretive journey aboard one of the 1/8th scale diesel or steam locomotives at the park and get a feeling of what the railway was like in Western Canada during the pioneer days. The journey will take you over hills, across trestles and through tunnels across the varied landscape. Snacks and souvenirs can be found in the full size replica of a CPR station on site. Picnic tables on site provide a place for small family gatherings. Smoking, Pets, Alcoholic Beverages and Private BBQ's or Hibachis are not permitted on the site on public run days. The park is leased from the City of Airdrie and operated by the Alberta Model Engineering Society, which was incorporated in 1971. Anyone who wants to volunteer is welcome to come and put their skills to work by helping create and maintain a unique and special place within the community. The park is a work in progress with big ideas to add a small scale farmstead, town and industries typical to the journey. Check our "Open Days/ Schedule tab above for pricing information. Birthday Party Bookings for the 2019 season is now available, online only. See Birthdays/Events tab above. Our normal operating days are Sundays between the Victoria Day/May Long weekend and Thanksgiving weekend. And we do plan to host our usual "Frostbite Run" on Family Day Monday in February, weather permitting of course. Always consult our Facebook page or this web page for the latest run day information. We are getting ready for our opening day, Sunday May 19, 2019.
every Sunday between 11AM and 4PM until October 13, 2019.